At Mahaffey, our expert project managers work closely with clients to determine their structural needs. We ask many questions to help our clients consider everything they need to do in or around their temporary structure. For example, if heavy equipment is going to be stored in a temporary structure, gravel or dirt might be suitable flooring. 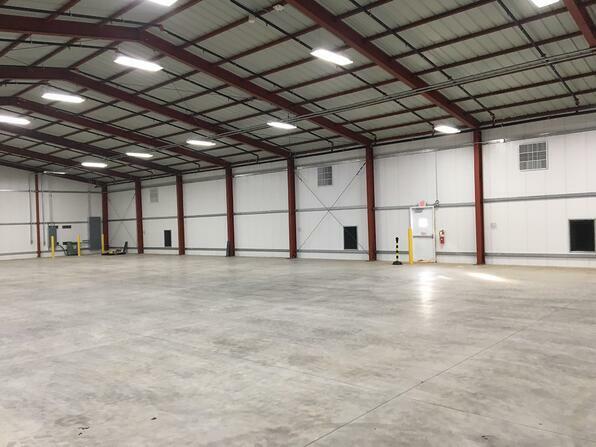 However, if the structure is being used to warehouse goods and supplies, some type of flooring may be necessary to provide protection from the elements. Similarly, structures used for the manufacturing of goods often require a hard surface floor to hold people and machinery. Break tents where people will be eating often need to have a hard surface flooring that can be cleaned and sanitized. Concrete is an ideal choice for all of these needs because it can be used for nearly any type of task your work may demand. Many companies turn to temporary fabric structures as part of their business continuity plan when they need to expand or keep operations running. Temporary structures often take the place of traditional construction entirely, but sometimes they are put in place in advance of a permanent structure. In these cases, clients can pre-design their concrete foundation to accept the building that will be coming later and engineer their temporary structure to work within those parameters. Project managers work carefully with clients choosing to go this route to consider anchor options such as ballasts or stake holes that can easily be filled with backfill. Mahaffey’s ability to remove temporary structures without causing permanent structural damage to foundations means growing companies can use their structure immediately and invest in the capital improvement plan to come. Temporary structures are highly engineered to provide dependable safety in the harshest climates and in the toughest industries. We take into consideration uplifts and snow loads as well as safety regulations for structures like blast tents. Concrete foundations are sometimes used in blast structures to provide the required level of structural stability necessary to keep users safe. Once someone knows they need a concrete foundation, there are three types of a concrete foundation used in temporary structures. Slab Foundation – This is a large, flat surface that spans the entire footprint of a structure. It typically ranges from 4-8” in thickness depending on how the structure is going to be used. This foundation can be useful when a temporary structure is being built over underground pipes or electric cables that might be damaged with the types of stakes typically used to anchor temporary structures installed directly on the earth. Ring Beam – Some people choose to only pour concrete around the perimeter of their structure, creating a “ring” that will hold the footplates of the temporary structure. Ring beams are constructed by digging a trench and building wooden frames that provide the shape of the concrete. Once the concrete sets, the forms are removed and the trench is backfilled. Sometimes a surface level of gravel is also added for the interior surface of the structure. This is an economical way to add the stability of a concrete foundation without the full slab. Pier – In this construction model, concrete is poured only where footplates will be anchored to the ground. It is often used in locations where a customer plans to use the existing ground surface--typically dirt or gravel--but the underlying soil does not provide enough stability to maintain the structure’s load. When companies choose to invest in pouring a concrete foundation, they also have an opportunity to add features that can make their temporary structure more user-friendly. For example, ramps can make it easier to navigate equipment into structures. Mahaffey temporary structures can also incorporate a “brick edge” to help protect valuable merchandise and equipment stored inside from rainwater damage. This edge can be compared to the curb on a street. To understand how this works, consider how sidewalks are raised several inches above the street so any run-off can be drained into city sanitation systems before impacting the areas where people would walk. In temporary structures, this type of foundation is poured with a lowered edge around the perimeter for the structure’s fabric walls to sit on. 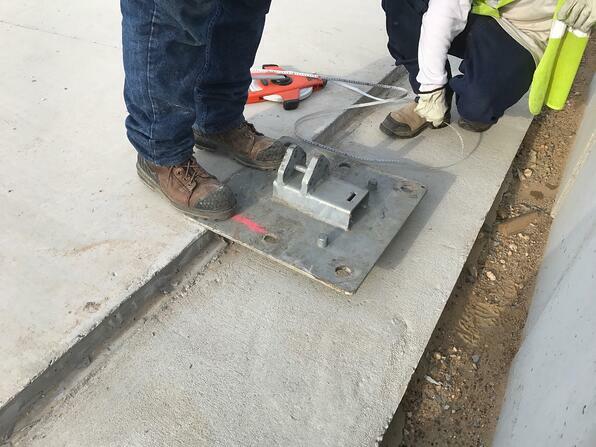 To keep the legs of the fabric walls in place, steel footplates are securely anchored to the lowered edge. Because the interior of the structure is actually a few inches higher than the edge of the fabric wall, water that is shed off the roof is caught in the “curb,” or brick edge, keeping structures dry inside. Whether they are providing extra stability to accommodate extreme weather conditions or keeping your people and products dry, concrete foundations are just another way that Mahaffey temporary fabric structures are customizable from top to bottom. Call us today to work with our expert project managers to see how our many options can serve you.